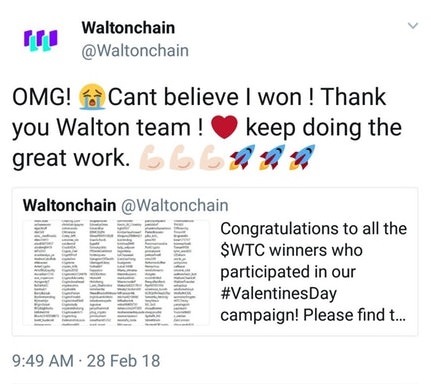 The tweet is designed to look like a fan of the ‘#ValentinesDay’ campaign won, but instead, it suggests that Waltonchain had no intention of letting anybody win. The tweet alone implies that Walton faked all the winners of the competition. This revelation has plummeted the price of the token from $22.11 to $18.11 in a mere 10 minutes (an 18% drop). The steep drop conveys that investors and day-traders are worried about the tweet and possibly disillusioned by the project. As of right now, the price is slowly rising again, but this could be a bull trap. Investors are wary of the future of Waltonchain. While the technology behind it may be sound, it means nothing to traders if the creators are dishonest. The coming days will show whether the company can regain the trust of its closest and most influential fans. This fraudulent activity regarding the giveaway comes just after Waltonchain’s competitor VeChain (VEN) showcased its rebranding. Speculators thought the rebrand would skyrocket the price of VeChain, but instead, for reasons currently unknown, the price has been dropping since. It was only after Waltonchain’s tweet that VeChain investors gained more confidence and the price began to climb back up. Of course, right now Vechain’s rise in price could be a bull trap too. It is possible that the blockchain industry is just not ready for cryptocurrencies which focus on the internet of things. 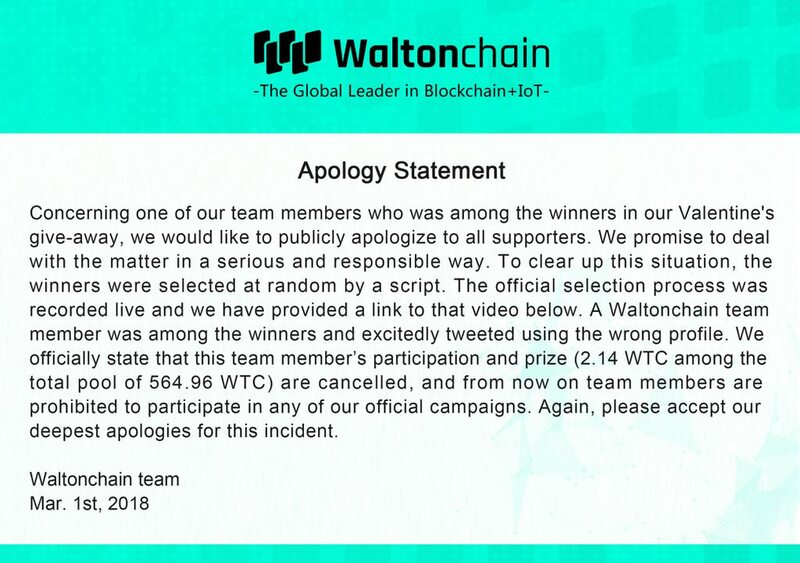 At 6:25 AM, Waltonchain released an ‘Apology Statement’ along with a video supposedly showing how the winners of the giveaway were randomly chosen. Let’s dissect this statement. Waltonchain is saying that members of the company were allowed to participate in the giveaway and that one of the members who won was also in charge of the Twitter account. This is worrying because it shows that team members are comfortable impersonating regular fans to create good press for the token. The tweet is designed to imply that the writer was merely a fan of the project and had no involvement with the organization. The fact that a member was so comfortable deceiving the public is a damning statement on the way Waltonchain train their staff. Not to mention the fact that Waltonchain allowing staff members to take part in a giveaway in the first place is deceptive behavior. There was a direct conflict of interest that should not have been breached. The next few days are critical for Waltonchain. Before the incident, it was considered one of 2018’s most promising blockchain projects. If it can regain its lost fans, or regain the trust of the public this situation will likely be ignored, but right now it is hard to say whether that will happen.